As a medical student I walked a lot (I couldn’t afford the bus) but also enjoyed jogging around the local area – a route that has now become Woodhouse Moor parkrun in Leeds. As a junior doctor I needed to keep active for my sanity and just used to run out of the front door for 20 minutes. In Cameroon where I worked as a missionary doctor for two years it was too hot (and would have looked odd) to do any specific exercise. Once I’d settled as a GP in Bedford, one of my practice nurses challenged us to put a team in for one of the early Race for Life series. From then on I’ve run regularly. I’d never thought of myself as a ‘runner’ though until five years ago. My brother in law was involved from the early days of parkrun in Bushy so excitedly told me that it was starting in Bedford. I have no hand eye co-ordination so was always the last picked at school for any team. I swim sometimes, long and slow breaststroke, like a swan. I can go for ages but find it boring. Likewise with the gym (my mum joined age 80 and challenged me with a five day trial membership). I find it really boring and I much prefer to be outside. Living on the top of a hill as a child I never learned to cycle until my daughter age four challenged me to learn. I’m still too wobbly to feel safe and enjoy it, plus I don’t think my bottom is the right shape! For me the biggest issue over the years has been time. As a junior doctor in the 1980s I was working up to 130 hours a week. Then as a GP in Bedford for 20 years sometimes I was doing on call shifts or had extra meetings, but also wanted to spend time with my daughter so exercise was last on the agenda. When I used to do the occasional keep fit video at home she always screamed through it! After having my daughter I weighed 12 stone which at 5’4” is far too much. One day a patient asked me when I was due. Never having been much good at dieting I had to combine it with exercise. When the same patient saw me a year later I thanked her for the negative comment (she had been highly embarrassed) and the stimulus it had been to get back to a BMI of 25. The other repeated comment I’ve had is about the dangers of running to knees. My mother and grandmother both had severe osteoarthritis but I’ve run for 35 plus years (admittedly not high volume) and have only had one very minor issue which was easily sorted by a physio. I now make sure I incorporate some strength training to protect my ageing body. I’ve occasionally been wolf whistled, particularly when I was a bigger girl, but have chosen to ignore that. My first goal was to run the whole of Race for Life 5km. Having achieved that I managed a 10km a couple of years later. I moved on to a cross country half marathon in support of a local charity and was hugely encouraged by Bedford parkrun. I met lots of Bedford Harriers there and set my sights on doing the London Marathon. I entered the ballot only to be rejected so entered Milton Keynes instead. At 16 miles of training I was doing a night hike with the church youth group and badly sprained my ankle. That put pay to the marathon and I came off the runners high with a bang. I didn’t accept it until the day of the marathon which was the foulest weather imaginable. The same happened the next year and I failed to get in to London again in 2014. Instead I set myself different targets: Silverstone half marathon (a very grey and cold race), the Womens Running MK 10km (at that stage it was on a Saturday and I don’t race much as most races are Sundays so conflict with church), and the Colworth marathon challenge. That was an incredible race, 5 miles on the Friday evening, 8.1 miles cross country on the Saturday and the same half that I’d done previously on the Sunday. In late June the sun came out on Friday lunchtime and went in as I finished the half. Though I did it, it was somewhat galling to be beaten by a dulux dog in the heat. 2015 was the year I had a prophylactic mastectomy and reconstruction having had a mastectomy, chemo and radiotherapy in 2008 for breast cancer. Whilst recuperating I watched the London Marathon and thought next year will be the year so again entered the ballot. I was not surprised (though the chances are slim) to get in on the ballot. I’d recently become friends at church with Emma who has a genetic deteriorating visual impairment and can only keep teaching due to her Guide Dog. That’s a whole story in itself and you can read her amazing blog here. Hence was born the idea to run for Guide Dogs. I couldn’t believe all the training went to plan despite horrendous difficulties in my work situation. One highlight of the training was when I was in a local park. I bumped into Iva Barr, at 87 the oldest person running London. She encouraged me to go slow and feed off the crowds. The other suggestion was running ‘Laps of Encouragement’. When I’d first announced my place, a patient and fellow parkrunner said, “Oh, that’s only 22 laps of Bedford Park”. Hence was birthed the idea of doing my last long training run lapping Bedford Park. I started with parkrun and then carried on, 18 laps (22 miles) in total with people joining me for as many laps as they wanted. Meanwhile Emma and Gus stayed at the café to encourage and chat to passers by. I never had less than three people with me on any lap and by chatting all the way I managed to keep the pace down. So this year I ran the London Marathon in 4.56.00 (or even less if you subtract a 4 minute loo queue- lesson learned, don’t queue behind men as if they were going to be speedy they would be in the urinal queue!) It was an incredible experience and I followed Iva’s advice at least until mile 20 when I realised that I was getting stiff from going just too slow. Guide Dogs put on a wonderful sports massage after. As everyone does, after the marathon I said never again. It is a very long way and the training takes forever when you don’t run as fast as Bedford’s local hero Paula Radcliffe. But Emma was inspired by the marathon and now has a place herself, to run it for Guide Dogs in 2017. Hopefully her husband will guide her but I’m the back up and will need to train up anyway to help with long runs as both she and her husband work full time. I’ve done a fantastic Guide Running course with England Athletic and British Blind Sport and am now working on couch to 5km with Emma. I’ve suffered depression in the past and running has really benefited my mental health. Despite a high powered job I’ve lacked self esteem but running has given me this in a family where almost everyone else is really good at sport. Running the marathon has been a real outlet for the incredible work stress that I’ve been under for the last year, enabling me to make some really important and life changing decisions in the week that followed the marathon. Doing parkrun has gained me a whole new community of friends. This must be the best innovation for getting the general public involved in exercise. I particularly want to endorse the recent movement to encourage walking at parkrun. Some of the fittest, fastest parkrunners can seem intimidating to those just starting out so it is encouraging to see the walking platform emerging. Losing weight, doing parkrun and then the marathon has been an encouragement to my patients. They see me out in the community doing what I preach and see that I’m not the fastest. Since the marathon I’ve had an unbelievable number of consultations that have particularly talked about running or getting moving. Being fit has helped me recover from various surgeries much faster and more easily. Find something you enjoy, it doesn’t even have to be a sport. If you’re sociable, find someone to go with. I loved parkrun tourism this morning. I ended up running slower than usual but managed to chat the whole way round. Start slowly. If you want to run, try couch to 5km, it’s really achievable, but do the running bits slowly too. My daughter has been doing it recently and combined it with parkrun, starting parkrun with the warm up and then running small bits. Gradually her times are improving as she runs more and she’s starting to pass the walkers. 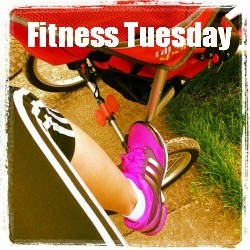 Invest in a good sports bra and OK trainers; no other costs are needed. When I think back to 35 plus years ago, in my normal bra and school plimsolls, I’m relieved that I did myself no permanent injuries! Think about an activity monitor, like a Fitbit . Despite walking down the corridor to collect each one of my patients, a busy Monday only got me 4000 steps, quite a revelation. This is particularly good for the geeky, or those who like to compete with themselves. Don’t push too hard at the start, your body will need rest days to recover, though these still shouldn’t be sitting still days! Previous PostIt’s official….I’m running the Boston Marathon! Next PostFive reasons why you should get your kids active.